This was my breakfast yesterday morning. Free range egg, bacon, tomato on rye toast. Look at how yellow the yolk is. And here's the raw material, today's eggs and the carton out of the fridge. We are the proud owner of two backyard chooks (that's Aussie slang for Chickens). Mel, the middle daughter hand raised our black chicken, Pesto, from practically an egg as part of her first year University Biology studies and I'm sure it thinks it is a puppy. At the very least it is imprinted on humans. You open the gate to go into the backyard and they coming running for a pat, affection and food. Pesto pinches the washing out of the washing basket as you are hanging it up but I think it thinks it is actually helping. It's no wonder, her nickname is Pest. This is Pesto when she first came home. As you can see she is incredibly inquisitive. "What's that? A camera! Are you taking my photo? Can I eat it?" We started with two Biology Chooks. The other one is called Slayer. (Yes, a boy named that one!). Slayer was always a follower chook. The temperament never did match the name. When we got her, she was very stressed and required hand feeding and cuddling for the first few days. Unfortunately one evening Slayer disappeared. All we found were some feathers. We suspect a fox. Here they are perched next to the back door trying to guilt people into letting them in the house and occasionally pretending they hate each other. So then we got Pappy at the Sunday market. Pappy is short for Paprika. Can you sense a chook naming theme going on here? Pappy got sick, wouldn't eat and slowly faded away. 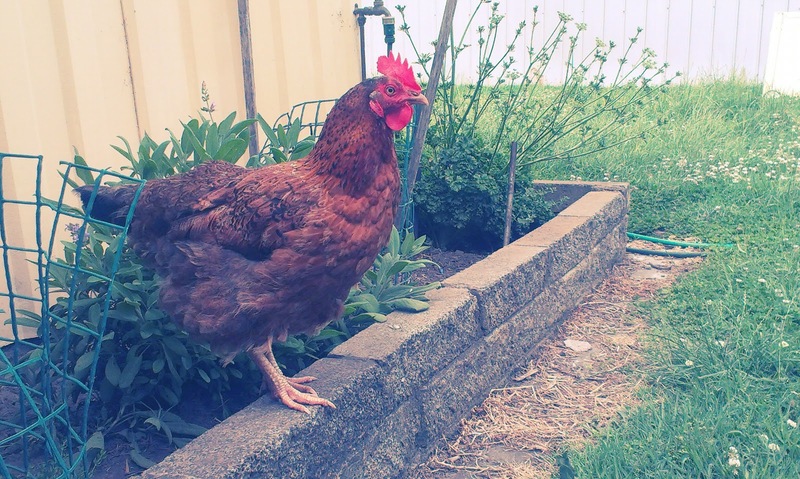 Is it possible for a Chicken to get an eating disorder? We miss Pappy. She was always up for a cuddle or a photo opportunity. So we were back to the Sunday market for a new friend chook for Pesto. Home came Nutmeg, quickly renamed Nutty. Nutty is a Welsummer and they lay the most beautiful brown speckled eggs. She's still a little stand offish. Pesto is also the current star of the Marketing Campaign for Science at our Campus of the University. Here's Pesto and Mel on the poster in the corridor at work which I walk past every day. 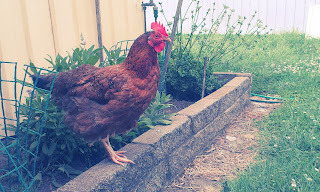 Have you ever tried taking a chicken on a photo shoot? It had a ball and was surprisingly better behaved than the dog which was also having its photo taken. Chooks should be part of the family.